A team of Indiana State University students captured first place in a recent "Jeopardy" tournament that included categories that were a little different than those used on the popular television game show. Instead of "Literature" and "American History," this competition featured such categories as "Cardiovascular Physiology, Exercise Testing/Prescription and Environmental Physiology." The ISU team of senior exercise science majors Joe Downing, Sara Hochgesang and Kaci Smith dominated multiple categories en route to winning the 10-team competition. The event took place Oct. 28-29 at the annual meeting of the Midwest chapter of the American College of Sports Medicine. A total of 16 Indiana State students participated in the meeting in Indianapolis. "Our students made sure the audience knew who we were. It was a very proud moment when the students ran the table in the category that I teach," said Derek Kingsley, research associate in ISU's department of kinesiology, recreation and sport and director of the Exercise and Cardiovascular Research Laboratory. Downing, from Terre Haute; Hochgesang, from Carmel; and Smith, from Alton, Ill., will represent the Midwest region at the organization's national meeting in San Francisco, May 29 through June 2, 2012 . 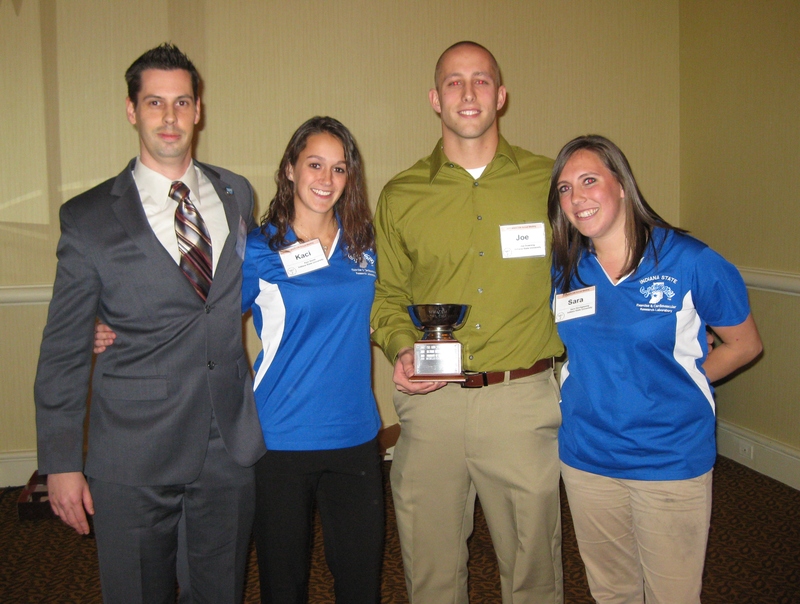 Photo: http://isuphoto.smugmug.com/photos/i-njJWST6/0/D/i-njJWST6-D.jpg - Derek Kingsley (left), a faculty member in Indiana State University's department of kinesiology, recreation and sport, poses with students Kaci Smith, Joe Downing and Sarah Hochgesang, who took first place in a "Jeopardy" tournament at the annual meeting of the Midwest chapter of the American College of Sports Medicine in Indianapolis.